I am a passionate advocate for school librarians’ instructional partner role. Research and my own experience suggest that classroom-library collaboration is a best practice and results in improved student learning outcomes. While building relationships with classroom teachers, it is critical for school librarians to build relationships with influencers and decision-makers. Principals and school superintendents who understand the impact of coteaching on student learning can help create the ideal environment for this practice: a state-certified professional school librarian, a flexibly scheduled libraries with sufficient support staff and a budget that affords engaging resources and technology tools. Principals and superintendents can advocate for vibrant school library programs. School librarians can collect and share stories designed to meet these decision-makers’ priorities as well as touch their emotions. There is a growing consensus about the importance of educators’ expertise to impact student learning. School librarians can collect advocacy stories from classroom teachers who can tell the stories of improvements in both their teaching and students’ learning as the result of classroom-library collaboration for instruction. Here are some examples. I appreciated the three things we were told to consider when “Communicating the Story”: What libraries and librarians really do that’s unique and valuable; why it matters in terms of their values and their priorities; and why it is urgent. Classroom-library coteaching answers all three of these questions for the administrators we seek to influence. School librarians are in a unique position. Similar to principals, we have a global view of the learning community. We know the entire curriculum; we work with all students and teachers in all disciplines. We know the resources that can help our teachers and students succeed. This global perspective is valuable to the learning community in determining what students must know and be able to do. We can help teachers plan across grade levels and content areas because we see the big picture. Principals and superintendents are focused on teacher improvement. When two educators—a classroom teacher and a school librarian—coplan, coteach, and coassess a lesson or unit of instruction, they learn from one another. This kind of job-embedded professional development can be part of the daily work of educators; it doesn’t cost anything (except as noted above in terms of scheduling, staffing, and resources). Coteaching happens in real time with real students. The results are observable by these decision-makers; the results in terms of student learning can be tangible. A culture of collaboration can transform a school or district. The urgency of improving teachers’ teaching and students’ learning will be clear to these administrators who are held accountable for student achievement by parents, school boards, and state- and federal-level education agencies. We cannot let students fall behind in reading comprehension, applying information-seeking processes, or using technology tools. These are basic and recognized 21st-century skills that can help our students be competitive in a global society and economy. Teachers must be up to date with strategies to meet these objectives. 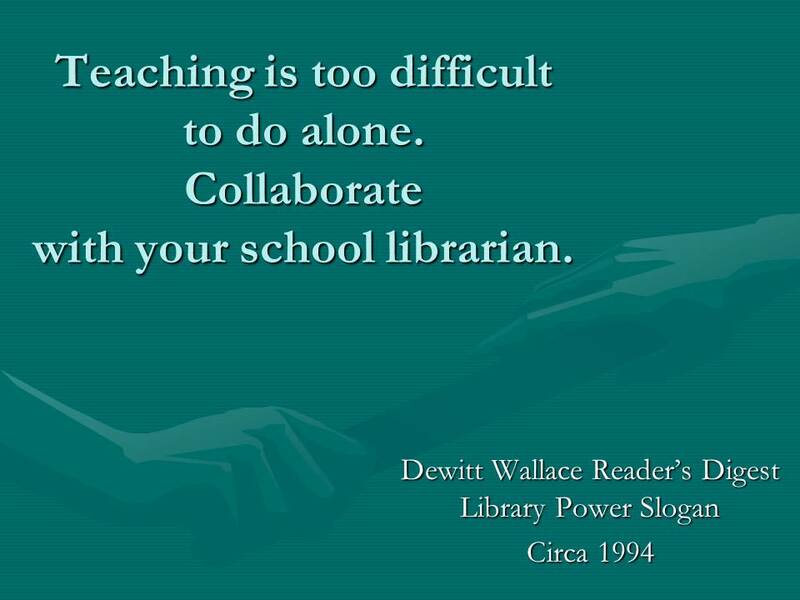 Finally, I want to borrow a slogan from a national school library advocacy campaign from the Dewitt Wallace-Reader’s Digest Library Power Project from 1990s. I believe it frames the message school librarians want/need to share in order to influence today’s decision-makers. “Teaching is too difficult to do alone. 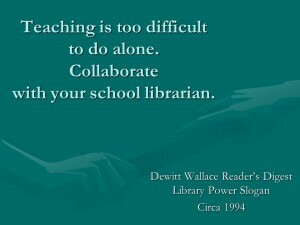 Collaborate with your school librarian.” This was true at the dawn of the Information Age and it is even truer now. Framing our message in terms of what teachers need is a way to show principals and superintendents that they have a partner in the school librarian—a partner who can help them meet their goal of an effective teaching force in our schools. This entry was posted in Advocacy, Coteaching and tagged Advocacy, coteaching, instructional partnerships by Judi Moreillon. Bookmark the permalink.